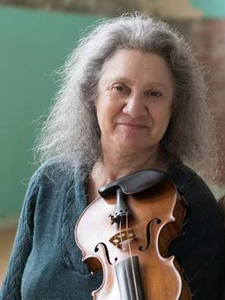 Deborah Greenblatt, championship fiddler, author of fiddle tune books, composer, recording artist and private music teacher, received her formal training at Boston University. Ms. Greenblatt's concerts are available for large and small groups of all ages, and include a variety of styles, stories, audience participation, and a question and answer session. Special shows include 'James Whitcomb Riley, the Fiddling Children's Poet,' 'Tales of Avoca-Repeatable Stories From the Old Schoolhouse, 'Fiddle Fables', 'The Feminist Manifesto', and 'Fiddling Styles & Tunes from Many Cultures.' For smaller groups, hands-on experiences with the instruments are encouraged. Ms. Greenblatt is well known for her stimulating fiddle workshops for fiddlers as well as students in school string programs and youth orchestras. Deborah and her husband, David Seay, often like to share residencies.